As the online ed tech universe burgeons with newer formats of educational content every day, there’s a realisation that is hitting most educational entrepreneurs: standing out is the need of the hour. It’s easy for a great course to get lost amidst the cluttered layers of the internet, and having it reach the right audience is critical for success. There are several factors that influence the distance a course will travel once it is launched into cyberspace. One of the most important, however, is the content of your course. With turnkey tools like Pinlearn available in the market, it’s easy to plug your content into a pre-designed eLearning interface and then plan a strategy on how to create an online course. In this article, we let you in on steps you can take to create a compelling online course that can cut through the clutter and reach a section of users that will likely embrace it. Here goes. If you worry that your course may not appeal to a wider audience, don’t. You can’t please the entire world with a course that may seem relevant to you. The truth is, a selection of users is all it takes to propel your course to success. Even a small segment of people multiplied by a reasonable per-course price can equal a significant amount of income for you. The challenge when thinking about how to create an online course is to get your content across to people who may find it interesting. It’s important to pick a subset of users that will give you maximum returns. Your strategy can go horribly wrong if you tailor your course to a segment that shows little inclination. Market research and insights are imperative in showing you the way. Let’s see how. There’s really no point designing a fabulous course without first understanding the needs of users. There are several ways to do this, but the first and foremost way is to become a user yourself. Scour the internet for learning courses from various countries and experience them firsthand. Weed out the bugs and the little things in them that tarnish your experience; the lag between course screens perhaps, or the cluttered nature of an interface. Interact with course users on virtual forums like Facebook, Twitter and community chats to learn what inspires users. Also, take the old school route of speaking to learners first hand about what drives them to pursue an online course. Once you have your user insights, arrange them into buckets to see which ones score the most, and align these with your core course to help you create and sell online courses. By pointing your module to the bulk of interested learners, you’re more likely to see momentum when you launch your course. Creating a course plan is a good place to start. Think of the topics you’ll include in your course, the communication you will send out via email, and your social media strategy. At this stage, you should hustle to piece your course together by asking potential users what they care about, what would interest them and course elements they would want included. Feedback is crucial at this point because your plan to create and sell online courses should pivot on inputs you get from your captive audience. The world of eLearning is endless and you’ll find numerous websites promising similar courses. To stand apart, it’s wise to pick a value proposition that lets you stand apart. Say, for instance, a freebie promotion, or an influencer-designed section in your course. Anything that makes heads turn is a winner. So, we spoke about Pinlearn earlier on this article. And for good reason. When you’re building an eLearning platform from scratch, there are several factors that must be aligned: your technology, your content and your communication approach, for starters. 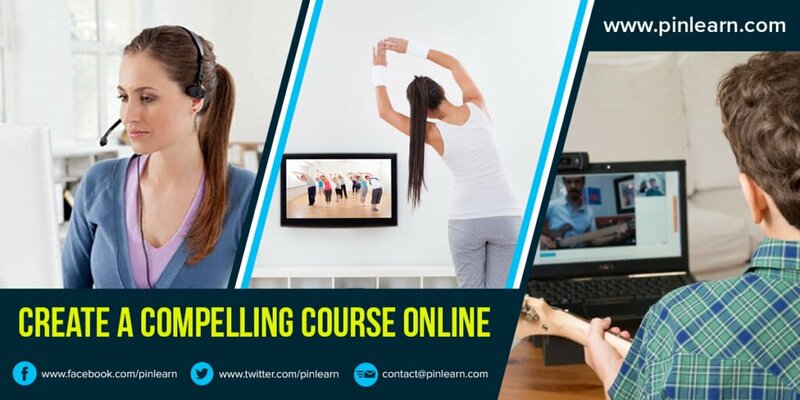 Pinlearn is a specialised technology designed exclusively for virtual learning platforms. Equipped with specific tools for teaching and a device-agnostic interface, it allows your users to learn on the go. Pinlearn’s technology stack rivals that of many renowned ed tech giants across the world. Its layers include Laravel 5.3 (PHP), Agular JS 1 for front end content delivery, Mysql and Redis Cache for high-speed performance and an NGINX web server that underpins overall operations. Once you have gathered inputs and created a content plan, it’s time to execute! Build on your plan by feeding your course into Pinlearn and inviting a sample set of users to experience the interface. You may face niggling issues at this stage, but you should be thorough by the time you roll around to your soft launch. Creating a compelling course is a science in itself. It involves analytics, user insights and a course framework that meshes with your users’ preferences. If your approach is methodical, you have no reason to fret. There’s always a little cyber market share waiting to be captured.